For two days in mid-September, Ennigerloh was the place to be for experts and users in the pharmaceutical industry doing research in the area of continuous manufacturing. They accepted the invitation of L.B. Bohle Maschinen + Verfahren to the “2nd Continuous Pharmaceutical Manufacturing Symposium“ to discuss the processes of the future. “We are in constant exchange with scientists are at the technological forefront when it comes to continuous processes for the pharmaceutical industry," reports Tim Remmert, Managing Director. “For pharmaceutical manufacturers, continuous manufacturing means shorter time to market, more flexible production even of small batches and highest precision and quality due to comprehensive process monitoring and control,” added Thorsten Wesselmann, Technical Director. "This saves time and costs for our customers in the pharmaceutical industry." More than 40 guests from Asia, South America, North America and, last but not least, Europe exchanged views on the current state of developments and discussed future steps at the symposium. At the globally unique Technology Center the participants had the chance to get a first-hand impression of the sensor technology measurement, analysis and control technology in practical application. Tim Remmert outlined that the implementation of continuous manufacturing processes have got a high priority for all pharmaceutical manufacturers. At the same time, all parties involved must be aware that perseverance is required due to the long-term planning of new production plants. L.B. Bohle has now combined all activities surrounding continuous processes under the umbrella name QbCon as a brand to strengthen its position “QbCon stands for Quality by Continuous Manufacturing”, explained Dr. Robin Meier, Scientific Director, to the participants. 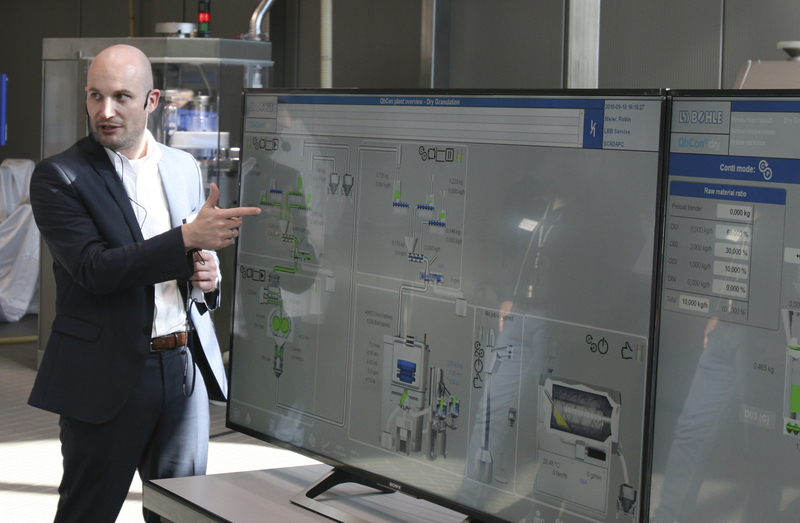 QbCon 1, the first truly continuous twin-screw granulator and dryer, celebrated its world premiere in June at ACHEMA. During the symposium L.B. Bohle unveiled the further development of QbCon 25 to the participants from all over the world.